Values are ideals in life that mean something to a certain person or group of people. Values shape the way people live their lives, how they interact with others and how they feel about themselves. Values are learned, usually passed down from generation to generation. However, a family may decide to create new values depending upon what they find important in their own family. The creation of a value system can be simple or complex, depending on who is doing the creating. Families may have very simple value systems, with only a few things held near and dear to their hearts. 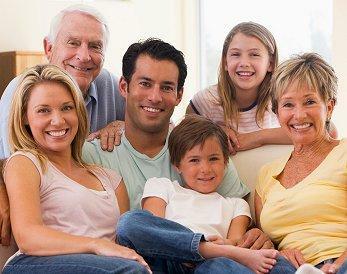 Other families may have many values and showcase diversity in values across different generations, or simply across various nuclear families with the extended family. Multicultural families often have several sets of values operating within a single home. The creation and teaching of a value system should be done with input from all people who will be affected by the values. People will be more likely to respect and uphold a value system they had a hand in creating. This is especially true in families with children; children should have some say in what is important to the family, since they are a part of the unit the values will be affecting also. While children should be a part of the creation process, use this as an opportunity to help children understand common values that may currently still be beyond their grasp, such as integrity, grace, and empathy. Family values need to be important to all members of the group. Values can help solidify a family unit and bring people together, so they must feel as if the value is important to them as an individual and the family as a whole. In order for a value system to be successful, the members choosing the list of values must feel important first. Start with a small system of three to five values everyone agrees upon, then build upon those existing ideals as the idea of having common values solidifies. These values define individuals and families, and guide people into becoming the kind of human beings other people look up to and appreciate. Values can have a considerable impact on a family in both a positive and a negative way. Positive values, such as acceptance and trust, can help families avoid secrets or even help members cope with fundamental developmental difficulties. Negative values, like a belief in violence to solve problems or a fundamental belief in racism, can be detrimental to younger family members who are easily influenced and often carry on a life of bigotry and hate after growing up in such families. The positive influence of values, as well as the negative, is evident in a variety of environments, from school and work to the community at large. The effects of values can be seen in how a person interacts with others around him and how other people respond to his actions. People who were primarily influenced by positive family values tend to be successful, well-liked individuals who are adjusted and comfortable with their place in the world. People influenced by negative values often have volatile relationships and struggle to find a comfortable footing in society. Armed with the knowledge the negative family values have a lasting effect on everyone, especially the youngest family members, parents can emphasize positive values in order to help their children grow into well-adjusted adults. While negative values will always continue to exist, counterbalancing them with positive ones is a step in the right direction.